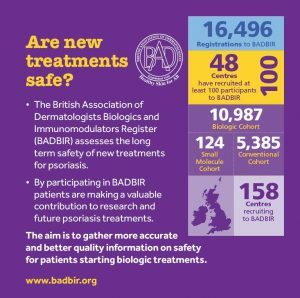 British Association of Dermatologists Biologic and Immunomodulators Register (BADBIR) is a UK and Eire observational study, based at the University of Manchester, which seeks to assess the long-term safety of biologic treatments for psoriasis. Currently over 150 hospital sites across the UK and Eire are taking part in BADBIR by recruiting participants to join the Register. Once a patient has joined BADBIR, they are followed via their dermatologist as we assess their clinical details. BADBIR’s current study end date is in 2028. More information on BADBIR can be found on their website. The Biomarkers of Systemic Treatment Outcomes in Psoriasis study (B-STOP) is a non-commercial observational study which started in 2011. Patients suffering from severe psoriasis have a range of treatment options available to them but response to these treatments varies widely from patient to patient. 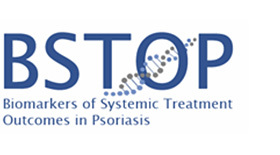 The B-STOP study examines which gene(s) and other ‘biomarkers’ are important in determining good or poor responses to the drugs that are used to treat psoriasis. Once discovered, researchers can identify which treatments are most likely to work in a patient, rather than the current approach which is ‘try it and see’. iMAP (Investigating Medication Adherence in Psoriasis) is iMAP is a national multisite study involving the collection of longitudinal biomedical and psychological patient data on over 400 individuals from 35 dermatology centres. It is linked with the British Association of Dermatologists Biologic Interventions Register (BADBIR) and part of the MRC funded Psoriasis Stratification to Optimise Relevant Therapy (PSORT) research consortium. The aim of this work is to identify new psychophysiological and behavioural factors associated with poor treatment response, in addition to answering key questions about medication adherence, clinical implementation and management. (NIHR CRN: 13337B). 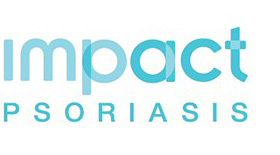 The Identification and Management of Psoriasis Associated ComorbidiTy (IMPACT) programme of research is a collaboration between Salford Royal NHS Foundation Trust, the University of Manchester, and the Psoriasis Association. IMPACT is funded by the National Institute for Health Research (NIHR). Their mission is to apply the best available knowledge to devise responsive services to improve the care of people with psoriasis. 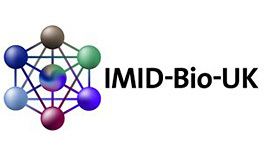 The Immune-Mediated Inflammatory Disease Biobanks in the UK (IMID-Bio-UK) has been funded by the Medical Research Council (MR/R014191/1) to bring together eight immune-mediated inflammatory disease (IMID) cohorts / tissue biobanks including PSORT, into one single searchable and analysable dataset available to all bona fide researchers whether they are from academia or industrial institutions. Its initial focus will be rheumatoid arthritis (RA), systemic lupus erythematosus (SLE), psoriasis, primary biliary cholangitis (PBC), autoimmune hepatitis (AIH), and primary Sjögren’s syndrome.